At Chirofit, by getting to the root cause of your condition we see quicker and more complete recovery of nerve and musculoskeletal injuries. Whether you’ve experience chiropractic before or new to chiropractic care, you will feel the difference in these precise yet gentle adjustments. Dr. Rencher restores your body to its relaxed and flexible state of harmony. You’ll begin to wonder why you waited so long to get this care. Dr. Rencher uses the Gonstead Technique. This method of chiropractic uses a scientific and biomechanical analysis. 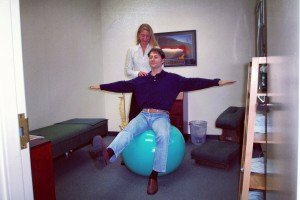 Dr. Rencher has helped thousands of people around the world, and has taught the Gonstead Technique to students and other chiropractors nationwide. Whether you are suffering from chronic neck pain, sports injuries, car accident, disc injuries, sciatica, or carpal tunnel we can help you. Pain medications, injections, even physical therapy may help you temporarily but our goal is to find the source of that pain and resolve it so your body can heal fully. Sciatica pain, herniated discs, pinched nerves, migraines, stiff joints, sprains and whiplash need the proper alignment to heal fully. Whiplash, headaches, back pain loss of sleep and other joint injuries may come on immediately or worsen weeks after your accident. It’s best to have your injuries evaluated immediately after your accident. In most cases, your treatments are covered in full by the car insurance. When the skeletal system is misaligned, the body will begin to compensate for this imbalance. Every time you take a step with your misaligned body, the muscles are being recruited improperly. This is why at Chirofit, you will often see my patients walking on the sidewalk around my building to train their muscles after the adjustment. Massages. ART (Active Release Technique) are given to assist the body in healing fully. Old injuries may require deeper types of massage to permit full motion of your joints. Exercises will be given at the office and for home programs to help you maintain your adjustments. You’ll learn everything from proper sleeping positions to strengthening exercises, helping you to put those symptoms in the past. Unfortunately, many of our patients have taken a long route of unsuccessful treatments before they reach our office. If you haven’t seen results with prior chiropractic, medical treatments, physiotherapy, podiatry care, it’s very likely that we hold the key to your recovery. If you’re still on the fence, consult with Dr. Rencher, she offers a free 10 minute consultation. I came to Dr. Rencher with back pain, migraines, and asthma. In the past 13 years I have struggled with these problems. I was offered pills or nothing at all by other healthcare providers. And I have been to other chiropractors. Because a friend referred Dr. Rencher to me I have finally found effective help. With Dr. Rencher’s treatments I have had only one migraine in 10 months. I no longer need pills for pain and my asthma is under control! Dr. Rencher is awesome! She truly cares about your health.